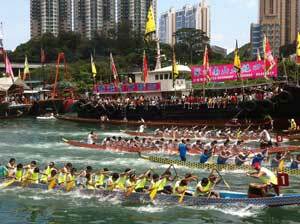 The Dragon Boat Festival in Hong Kong, also known as Tuen Ng Festival, celebrated on the fifth day of the fifth moon every year. This holiday celebrates the attempted rescue and tragic death of Chu Yuan, who died in 288 BC. Many in Hong Kong join in on dragon boat races in honor of one of the attempted ways for rescue. A dragon boat is a huge war canoe that seats up to 80 rowers and has a dragon head and tail carved in the front and back. Legend has it that Chu Yuan angered the new king of China and was exiled, but Yuan couldn't handle that so he threw himself into river Mi-Lo. In attempt to rescue this respected man, numerous Chinese rowed down in their dragon boats with drums and dumplings to keep the fish from eating his body. Hence the dragon boat races came to be and many countries around the world participate in these races to test their strength.